From some time, the cosmetics market has been flooding us with cosmetic boxes that many people are willing to subscribe to. I like the idea of such boxes although so far no one has attracted my attention so much to buy anything, until now. If you are curious what box it is and what it contains, I invite you cordially to the post. When I was looking for promotions to the Current Promotion tab on the Smashbox website, I found a Beauty Box Funmi Fetto. It's a box which we don't have to subscribe etc. we just simply buy on the website of any brand whose cosmetics are inside. It cost me £25 but on Topcashback was a 6% return offer what gave me £1.31 back so summarizing I paid £23.69. Inside there were two full-size products and six quite a big miniatures, which totally were worth much more than the price of the box. First time I ordered from Smasbox and only about what I can complain is a terribly long shipping because I was waiting for my order almost 2 weeks where to compare things from Asian stores I get in a week, so total fail for such a large company. 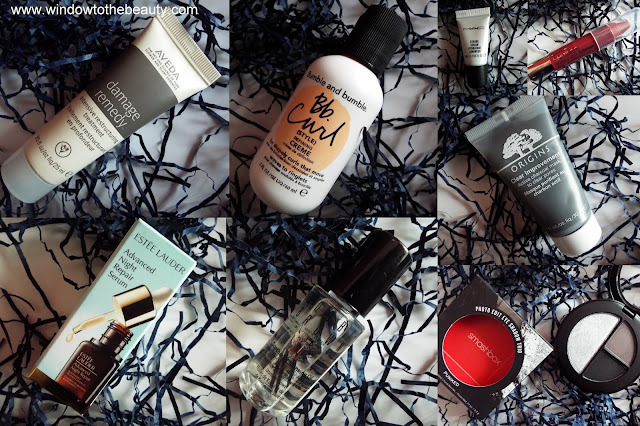 Generally I really like the selection of products, I wanted to test the Estee Lauder serum, the lipstick has the perfect shade for autumn, I already had an Origins mask so I will add it to next giveaway, Smashbox and Bobbi brown brand I also wanted to test, so the content I really like. I will be check out their next boxes because if they still will have such good high-end brands, I will definitely be interested. It's a really cool way to check if such cosmetic suit us before decide to buy full-sized product and get to know new brands. Do you know these cosmetics?